A group of sites for a Newmarket, NH business organizing road running races in New England. A local business located in Newmarket, NH needs a group of websites for road running races it organizes for running enthusiasts. A common WordPress Theme was developed that allows flexible changes to the header, background, and page navigation menu. 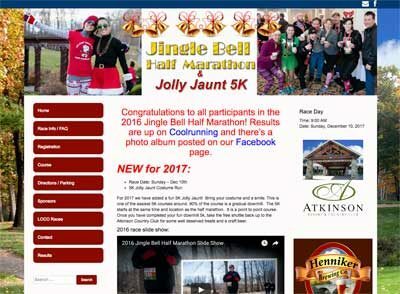 A series of WordPress sites were developed for all the road races. The client can easily update the sites on their own. The sites are maintained with monthly software updates and security plugins.